The concept of “deep battle”, which contained the doctrinal use of the Soviet heavy tank, was first theorized during the late twenties, then refined and eventually adopted by the Red Army Field Regulations in 1936. The tactical deep battle doctrine advocated for fast battle tanks (BT series and T-26), reconnaissance types (T-27, T-37A, T-38 tanks and tankettes) and medium or heavy penetration tanks (“Tyazholy”). The latter were also also called “siege tanks” and had to be able to resist most AT gun calibers, either deployed by enemy infantry or other tanks, and to destroy them as well. They were to be placed on key tactical positions to drag and concentrate enemy fire, or destroy enemy fortified positions while assisting infantry. Protection was therefore given priority over mobility. 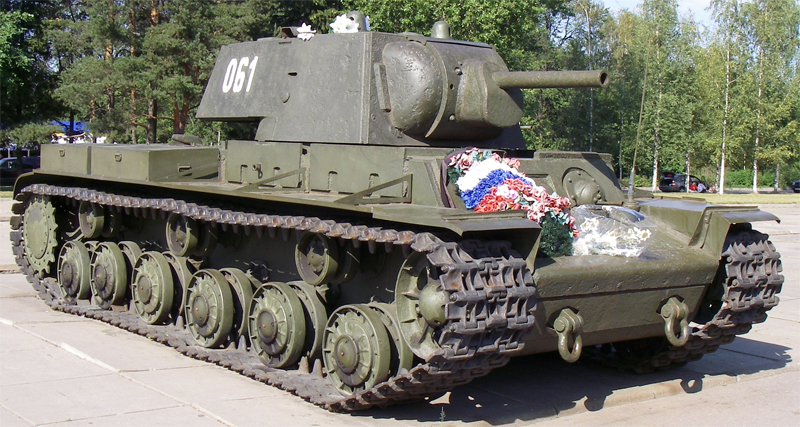 After the T-28, which was considered a medium, infantry tank design, the T-35 became the first of these heavy tanks to enter service with the USSR. This was a true monster, influenced by the multi-turreted fad which came from Great Britain, but was quite complicated and unsatisfactory in operations. A new 1937 specification gave birth to the two T-100s and the unique SMK prototype, showing a new arrangement of firepower, with tandem turrets. All three were tested in operations in Finland during the “Winter War” (September-December 1939). They proved resistant, but showed very poor reliability and mobility. They were also costly, over-complicated and difficult to maintain. Another prototype however, the KV, had been drawn by the same team which designed the SMK, as a single-turreted variant. During these operations, the two KV prototypes outperformed the others and the type was subsequently approved for a 50-unit pre-series under the name of KV-1. The TsKB-2 design bureau responsible for the SMK, through chief engineer Zh. Kotin, designed at first an all-welded hull with cast turret and large parts, with wide, reinforced tracks and a torsion-bar suspension. Alongside the SMK, the KV, named after People’s Defense Commissioner and political statesman Kliment Voroshilov, was essentially a single-turret variant, the weight saved being utilized for extra frontal and side protection, without any sacrifice to mobility. Initially not meant for production, the KV was given direct approval from Stalin himself. This model should have been named “Kotin-Stalin” (KS-1) instead. A wooden mockup was ready in April 1939, and first presentation to the general staff in September. Both prototypes were tested at the Kubinka proving grounds near Moscow, and immediately after in real combat conditions in Finland. The two KV prototypes and the first 50 preseries KV-1s were virtually identical, only differing by some redesigned parts for easier production. The hull, transmission, optics and torsion bar suspension were all borrowed from the SMK. Production was first assumed by Kirov Factory, ChTZ, and the first 50 were part of the “model 1939”, but were delivered in March 1940. The model 1939 was nearing 45 tons in weight, with a long hull (6.75 m/22.14 ft), relatively narrow if not for the very large tracks. The generous mudguards above gave exceptional room for storage. However, as no transmission was able to cope with such mass, the designers found an expedient, giving both prototypes and the SMK an old but sturdy Caterpillar system, which proved tricky, even unreliable in operations. The driver sat in the middle and the radio operator/machine gunner sat on the left, the three other crew members being located in and below the turret. They had poor visibility, with narrow vision slits. The driver had his frontal slit made of poor quality laminated glass, which proved blurred most of the time and his vision periscope had limited traverse. The commander (which also the loader) had two turret periscopes. The wheel train comprised front idler wheels and rear drive sprockets (like on the T-28) and a set of 6 twin roadwheel bogies, each sprung to an independent torsion-bar apparatus. There were also, due to the weight of the tracks, three large and thick return rollers. These large tracks had excellent traction on soft ground (snow and mud). The protection, reaching 90 mm (3.54 in) on the front (glacis and turret), was unrivaled for the time, if not for rare equivalents like the British Matilda II (80 mm/3.15 in) and the French B1 bis (70 mm/2.76 in), but way ahead of any German tank. At first, the 76.2 mm (3 in) F-32 was chosen as main armament, but due to delays in production, the first 50 preseries models and all remaining model 1939s were equipped with a medium-velocity “short” barrel L-11 of the same caliber, fitted with a recognizable recuperator above the barrel. The F-32 was able to fire AP (F-342 rounds) and HE shells. The BR-3502 AP rounds were capable of reaching 612 m/sec (2007 ft/s), giving them a 66 mm (2.6 in) armor-piercing capacity at 500 m (1640 ft). Secondary armament comprised a coaxial DT 7.62 mm (0.3 in) machine gun, another in a rear turret ballmount, another mounted in a hull ballmount and an extra AA mount on the model 1942. The engine was the 12-cylinder diesel model V-1, giving 600 hp@2000 rpm (450 kW), and then V2 (model 1940), fed with a 615 liters capacity storage. In all, 141 model 1939s were delivered, followed by 243 to 250 of the model 1940. Most were delivered during 1940 and early 1941. The model 1940 (also called KV-1A) was equipped with the longer F-32 gun and a new mantlet. When production began the German invasion was on its way. The Kirov factory was later moved at Chelyabinsk during the winter of 1941, and a new model was designed. Before the model 1941 production started and the factory was relocated near the Urals, many KV-1s were taken over for an expedient armor improvement. These versions, called “Ekranami” (“with screens”), received tailored 20 mm (0.79 in) soft steel plates, bolted-on (with huge bolts), as appliqué to the turret, frontal glacis and sides of the hull. These KV-1Es were mostly surviving units of the earlier model 1939, which were up-gunned with the F-32 in the same process, and later 1940 and 1941 models, sometimes damaged and recovered tanks. Exact number of this variant remains mysterious. Some sources speaks of 150 to 200+ units being converted in 1942. This was a response to new German tactics, hastily devised on the spot to counter the impregnable KV-1. The introduction of the new Pak-38 and Pak-40 AT guns and later some airborne weapons, like the MK 101 fielded by the Henschel 129 ground attack aircraft, urged this conversion. Total armor thickness was around 110-120 mm (4.33-4.72 in), making the KV-1 once again nearly impregnable. The model 1941 was designed and produced at Chelyabinsk. A model F-34 gun was fitted. This was the same gun installed on most T-34/76s. As a response to the field-expedient appliqué armor, the hull, sides and turret were protected by an additional 25 to 35 mm (0.98-1.38 in) of extra armor, and the turret was now cast instead of welded. This version also introduced many simplifications for mass-production. However, it was slow to arrive at the front, and the first model 1941 became operational in early to mid-1942 at best. The late production tanks received an even longer barreled gun, the ZiS-5 76.2 mm (3 in). This increased somewhat its penetrating performances. However, by the fall of 1942, new German tanks, like the Panzer IV F2 and 50 mm (1.97 in) armed late Panzer IIIs, outranged the KV-1 while still being able to pierce it. This version however still retained the original V12 diesel, and was decidedly underpowered. Speed was reduced further and this proved an issue in combined operations alongside the T-34. Production of this model was around 1200 units, according to the factory log. The model 1942 was essentially a late up-armored model (10-15 mm/0.39-0.59 in), either with a cast or welded turret. This was also the biggest production of the type, with around 1700 units. They were also all armed with the 76.2 mm (3 in) ZiS-5 and sometimes equipped with AA mounts. However, criticism about the series prompted parallel studies to improve the KV-1 as a whole. These reports stated that its only asset was excellent protection, however, speed and agility were poor, the transmission proved often prone to break downs, the suspensions, crumbling under the raising weight also showed critical stress failures, as well as the overwhelmed engine (the V12 V-2K, a modified version of the T-34 diesel). Final weight of this 1942 version was around 48 tons. Only the German Tiger was equivalent in weight, but was equipped with better optics and a gun which far outclassed anything on the field. This led to the two last improved versions of the type, before the production really stopped in favor of better designs. The main criticism about the weight imposed a completely revised version with somewhat “downgraded armor”, in order to regain some agility. In fact, this was not an equal sacrifice. Some vital parts, determined after carefully studied statistics about tank loss reports, were still well protected, while sacrificing others. This was a near “all-or-nothing” protection, which also came with special tactical maneuver instructions in order to reduce the exposure of these “weak spots” to the enemy. However, the engine was untouched. Another improvement concerned the cast turret, which was redesigned completely, lower, smaller, with slightly sloped sides and, most importantly for the first time, fitted with a real commander cupola bearing all-around vision blocks, which in turn greatly improved the overall vision and efficiency of the commander. However, this KV-1S (for “Skorostnoy” – “fast”), was still much more expensive than the T-34/76, for the relative same performances. By late 1943, there were concerns about the cancellation of this new version, which occurred after 1370 had been delivered, from autumn 1942 to the fall of 1943. Total weight was 42 tons, and protection ranged from 30 to 75 mm (1.18-2.95 in). The main armament, a 76.2 mm (3 in) L42, was fed by 114 rounds, and the three DT machine-guns by 3000 rounds. Another strong criticism about the KV-1 concerned its main armament, which was the same as the medium main tank of the Red Army, the T-34. But the KV-1 was more expensive and with far less mobility. A better gun could have effectively saved the KV-1, making something comparable to the last version of the Panzer IV or the Tiger. By 1943, Lieutenant-Colonel Kotin’s technical bureau was split in two, a part being affected to studying a new stopgap heavy tank based on the KV-1, waiting for its replacement to come. The team naturally chose the improved KV-1S, but increased the armor protection in vital parts to 110 mm (4.3 in), and widened slightly the hull to accommodate a larger turret and gun, the 85 mm (3.35 in) D-5T which was also chosen to equip the IS-1. Due to this interim position, the KV-85 was only produced in limited quantity by the beginning of 1943. 143 units of this ultimate version will be delivered until the production stopped for good. The KV-85 had the same engine as its predecessors and was 46 tons strong, with thickness of 60 mm/2.36 in (hull), 75 mm/2.95 in (frontal glacis), to 100-110 mm/3.94-4.33 in (turret front, sides and rear). Max speed was around 40 km/h (29 mph) and range 250 km (155 mi). The DT-5 gun was a shorter derivative of the original 85 mm (3.35 in) AA gun (792 m/s or 2,598 ft/s muzzle velocity). As the production began in 1940, at a slow pace, only a handful of KV-1s were operational when Operation Barbarossa began. Usual figures are about 530 operational into twenty-nine mechanized corps, alongside all available T-34s (1590 tanks in all). They were about a third KV-1s for each of these units. They first met the Wehrmacht on June, 23, 1941, the second day of the invasion. More precisely, it was at the Battle of Raseiniai, when the Soviet 2nd Tank Division from the 3rd Mechanized Corps clashed with the 6th Panzer Division near Skaudvilė. They encountered little resistance from forces composed mainly of Pak-36 and 38 AT guns and Panzer 35(t) light tanks. 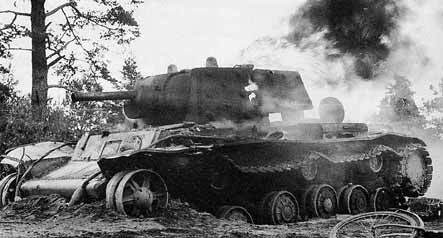 The next day, a single KV-1 successfully blocked any advance of some elements of the 6th Panzer Division for 24 hours, before running out of ammunition and retiring. It was hit by dozens of different calibers, but remained unscathed. At Krasnogvardeysk (Gatchina, near Leningrad) on August 14, 1941, a small unit of 5 well-hidden and entrenched KV-1s, plus two in reserve, with twice the usual ammunition supply, including a majority of AP shells, were skillfully placed around the single road bordering a swamp. This unit, commanded by Lieutenant Zinoviy Kolobanov, destroyed some 43 German tanks from German 8th PzD during a single half-hour action. Kolobanov was later awarded the Order of Lenin and made Hero of the USSR. The KV-2, heavy howitzer version. This was a generally unsuccessful variant. The turret was easy to spot, top-heavy, making the tank fairly unstable. Plus, the howitzer blast provoked excessive vibrations for the engine and transmission. Many alarming reports all pointed in the same direction. These “new” Russian tanks were nearly unstoppable. In fact, their existence had been one of the biggest blunders of German intelligence prior to the invasion. Facing these, the Germans had a total of 3266 tanks, but only 1146 Panzer IIIs and IVs armed with 50 mm (1.97 in) or 75 mm (2.95 in) guns, barely able to penetrate the armor (and only on weak spots) of the two models (T-34 and KV-1). Most of the KV-1s were concentrated in 6th, 4th, 8th and 15th Mechanized Corps during the summer, and all but one were sent in Ukraine. They suffered heavy losses however, despite being usually bypassed by the Panzers, left to the air support, field artillery and 88 mm (3.46 in) guns, or special antitank squads using shaped charge grenades. Many also broke down, ran low on fuel or were abandoned due to the confusion of the first two weeks of Barbarossa. The total losses were far greater anyway to those related by the German reports, and by the autumn 1941, few were still extant. Anyway, the impression left by the KV-1 (as well as the T-34, which was faster and more numerous), from the simple soldiers to the general staff, was huge. It triggered an unprecedented Panzerkommision on 20 November 1941, which studied remains of both tanks on the field. The T-34 is notable to have inspired the development of the sloped-armored Panther. After a ruthless relocation in dire conditions of the entire Russian war industry next to the Ural mountains, production of the KV-1 was resumed. Two models were produced alongside, the “cast turret” and “welded turret”, which otherwise were generally similar, bearing the same F32 gun. For easier production the model 1942 was a near-repeat of the former, although up-armored. Older models were massed together for the counter-offensive of Moscow in January 1942, but the Germans were now better prepared, although still fielding the same Panzer IIIs and IVs. Among these, many were upgraded as Ekranami versions, receiving thick appliqué bolted plates. This was a response to some new German weapons, like the shaped charges and airborne AT guns. Throughout 1942, the KV-1s performed well, although combined operations with the T-34 were problematic due to the speed difference between them. Too often, the KV-1s were relegated as support rearguards and committed only when encountering a fierce resistance. These tanks fought during nearly all major engagements of 1942-43, including the large counter-offensive of Stalingrad, in January 1943. By then, Soviet industry has produced enough T-34 to literally overwhelm the KV-1 in number (the latter being much costlier). Growing discontent about the type revolved usually around the same issues. It was too slow (easier to spot and target), prone to transmission failures, simply too heavy for many bridges and at the same time not equipped to ford deep rivers, and lacking range against the late 1942 German AT units and rearmed Panzer IVs. Late versions, even heavier, lost what was left of its former maneuverability, while at the same time still not being better armed than the T-34. Further heavy losses at Kursk proved they definitely found their match in the new German tanks generation. This situation was found acceptable for the general staff however, which considered them as breakthrough tanks, operating against infantry and fortified lines of defenses, firing HE shells at relatively short range and only carried a few AP rounds for occasional encounters. They kept this tactical specialization until late 1943, before being superseded by the IS-2. By 1944, the existing KV-1s were mostly of the late KV-85 type. Their heavy armor still proved effective while dealing with well-prepared German defenses. However, by the end of 1944, they were seen as obsolete. There is no evidence that any KV-1 or KV-85 took part in the battle of Berlin. When encountering difficulties on the heavily fortified Mannerheim line during the Winter War in Finland, the general staff demanded a specially equipped version fitted with a heavy howitzer, intended to deal with concrete bunkers, in support of the regular KV-1 units. But instead of choosing a more pragmatic solution of a traditional SPG, the Soviet engineers tried to get the best of both worlds in a hurry, while using the same turret ring to accommodate a fully traversable, redesigned turret to house the gargantuan howitzer. This gave the KV-2 an unmistakable profile, with its huge, towering turret, which was only accessible by a ladder. An obvious target which was also top heavy, compromising the lateral stability of the tank while crossing a sloped terrain. All these deficiencies were taken in account when the factory was relocated in the new “Tankograd” complex at the steps of the Ural. The production was no longer maintained. Only 334 were built in all from late 1939 to mid-1941. The KV-1 was also chosen to be used as platform for the new ATO-41 flame-thrower. The gun mantlet accommodated the flamethrower tube, a coaxial DT machine-gun and, replacing the former ZiS-5 gun, a 45 mm (1.77 in) QF model 1932 in disguise, housed inside a 76 mm (3 in) tube. The gun was standard issue on the BT series and the T-26, and had good penetration power against 20-25 mm (0.79-0.98 in) of armor. 45 units were converted using KV-1B hulls (model 1941), and later on, 25 more based on the upgraded KV-1S. 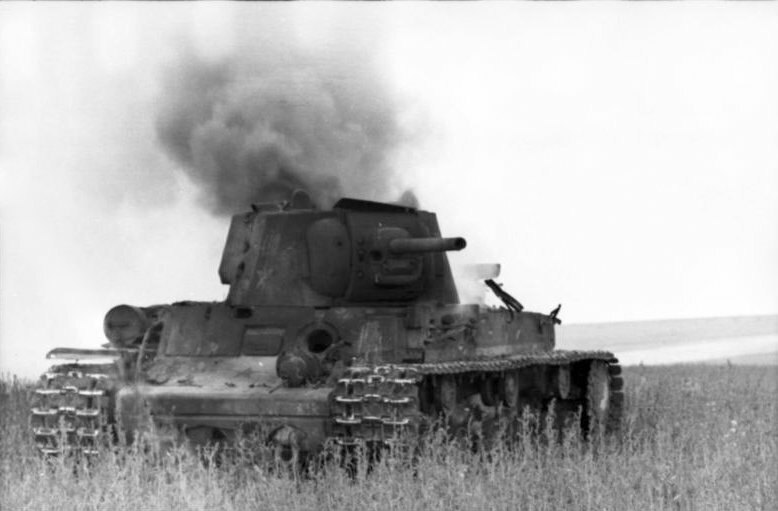 Two prototypes of the next version (KV-1M) and a few experimental units with the flame-thrower was relocated in the hull were also built and tested in combat. Probably the most distinctive Soviet SPG of the war, the SU-152 renewed the idea formerly tried, although unsuccessfully, by the KV-2. Developed relatively late in the war, for the upcoming Operation Uranus (the great Stalingrad counter-offensive), this “pillbox killer” was a more sound (and simpler) design. The long howitzer was simply relocated into the hull, making it easier to manufacture, more stable and more difficult to hit. It was based on the KV-1S and arrived in time for Kursk, proving also an excellent improvised anti-tank machine, soon nicknamed “the beast killer”. Later on it was associated to the great offensives of 1944-45 and was widely used (and photographed) during the battle of Berlin. Around 700 were built in all, including the late ISU-152 based on the improved IS-1 series chassis. The T-150, KV-220 and KV-220-2 were early 1942 projects with 700 to 850 bhp diesels, armed with 76 mm (3 in) to 85 mm (3.35 in) guns. One KV-13 was buit, being a new generation “universal” medium tank drawn in late 1942. The KV-1 chassis served as a basis for many tests, starting with the KV-3, a single prototype, which had an extra pair of rollers, a lengthened hull to accommodate a new 850 hp V-2SN engine, a hull protected (at the front) by 130 mm (5.12 in) of armor and a 107 mm (4.21 in) ZiS-6 gun. It was shipped to the front with a KV-1 turret and destroyed in combat by German field artillery in 1941. The KV-4 and KV-5 were even larger version, but stayed as paper projects. These super-heavy tanks would have been up to 150 tons. 20 different projects were proposed, but all cancelled by 1943 in favor of the IS-1. The experimental KV-7 was a self propelled-gun with three guns (one 76 and two 45 mm/3-1.77 in). The KV-9 was a battle-tested 122 mm (4.8 in) SPG prototype, which was an early forerunner for the SU-122 series. The U-18 and U-19 existed only as a mockups or on paper. The KV-10 (or KV-1K) was fitted with four 132 mm (5.2 in) M-13 rockets launchers installed on the large mud-guards, but remained a prototype. Only 148 of this promising intermediate model were built, before the IS-1 was introduced. It led anyway to four variants. The KV-85G was a competitor, also armed with a 85 mm (3.35 in) S-31 cannon, but the KV-85 was chosen instead. The KV-100 and 122 were prototype derivatives armed with a long 100 mm (3.94 in) or a 122 mm (4.8 in) gun, built and tested in 1943-44. They served as testbeds for the IS-2. Despite being plagued by problems due to a rushed conception, the formidable reputation of the KV-1 came first from a legendary sturdiness, which was paid in return by a record weight. It paved the way for the next generation of Soviet heavy tanks which took everything from it. Despite the name, their new turret and heavier guns, the IS (Iosif Stalin) series were still KV-1s in disguise. They borrowed everything from the chassis to the tracks, road wheels, suspensions, diesel engine, transmission and most of the equipment. And if the IS-3 (which was never to fire a shot before the capitulation) had a different look, with a brand new, entirely redesigned sloped hull and characteristic rounded, flat turret of the Soviet postwar design, it remained essentially a KV-1 inside. The KV-13 design tried briefly to reunite the T-34 and the KV-1 in a single package, but failed. However, its legacy was to endure in the very last Soviet heavy tank design, the T-10 (1958), after a long series from the IS-4 to the IS-7. They were to bring support to the more agile T-54/55 during the Cold War. But the heavy type had to definitely disappear in favor of the “universal” type, the main battle tank. The first KV-1 prototype in Finland with the 91st Tank Battalion of the 20th Heavy Tank Brigade, near Suma, 17-19 December 1939, alongside two T-100s and one SMK. KV-1 model 1939 with welded turret. Central front, summer 1941. KV-1 model 1940, Central front, autumn 1940. Slogan “For Russia”. KV-1 model 1940 of the Moscow heavy tactical reserve, winter 1941/42. Slogan: “For Stalin”. KV-1 model 1941 with a complex “Finnish” camouflage pattern, winter 1941/42. Also notice the new spoked wheels. KV-1 model 1940 s ekranami (up-armored). Unknown reserve front unit, summer 1942. KV-1B, Leningrad sector, winter 1941/42. The winter camouflage is another variation with omitted spots to create an alternative pattern. KV-1 model 1941, late production, 53rd Army of the Transcaucasian Front, Anglo-Soviet invasion of Iran, September 1941. Artist’s impression of a KV-1 model 1942 (fully cast turret) “Kutuzov” in white washable paint livery, unknown unit, Northern front, winter 1942/43. 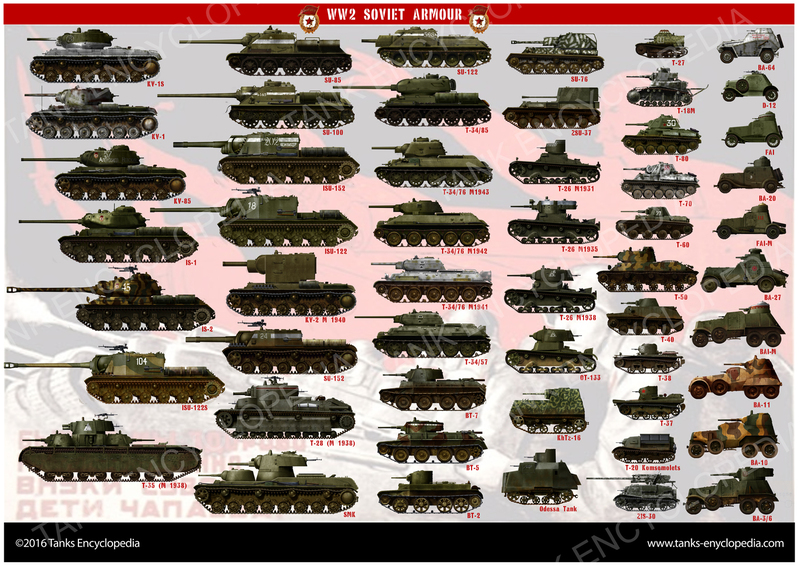 Many Soviet tanks were named after Soviet generals and heroes. KV-1 model 1942, unknown unit, Finnish front, March 1942. Notice the DT 7.62 mm (0.3 in) machine-gun AA mount and the faded white paint. KV-1 model 1942 (late production), Central front, early 1943. Slogan “Death for death”. The original factory green was modified due the passing of one winter and burning gasoline from an explosion and other chemicals. Fighting inside factories was not unusual in many street battles. KV-8 (flame-thrower version), 503rd Independent Armored Battalion, Volhovsky sector, summer 1942. PzkPfw KV-1B 753(r), SS Panzer Regiment of the 2nd SS Panzergrenadier Division “Das Reich”, Group Center, spring 1943. Notice the salmon camouflage over the standard dunkelgrau of captured units. KV-1C (Model 1942) or PzKpfw KV-IC 753(r), 3rd SS Panzer-Grenadier Division “Totenkopf”, Kharkov, March 1943. PanzerKampfwagen KV-1B 756(r), 204th Panzer Regiment, 22nd PanzerDivision, Kursk, summer 1943. PanzerKampfwagen KW-1 756(r) mit 75 mm KwK L/53, ?? Hi Wagner, after checking the source, it’s the L/43 gun indeed. Typo error. Another remark – in 1940 no such “Central front”, war begin in 22 july 1941. But tank can be manufactured in 1940 as well. KV-85, unknown unit of the Guards, Eastern Prussia, June 1944. This transition model between the KV-1 and IS-1 was only produced to a number of 143 machines. All right, thanks for this detailed correction of Cyrillic. You know how tricky it can be for us westerners… Using crappy translators, crappy photoshop font rendering, or just wrong modellers reference plates. I will correct these asap. The mass of the KV-1 is stated at 45 tons, however it is (according to wiki) 45 tonnes, which is a metric unit =45,000kg, 45 tons is an American standard unit which would be 90,000lbs. 90,000lbs is only 40,823kg. Please check your source, tonnes aren’t equal to tons and I’m not sure which one you meant to use. KV-1 model 1941 s ekranami (up-armored), unknown unit, Leningrad sector, winter 1942.—It means “Ehkranami” and i think it is a KV-1E. KV-1 model 1940 s ekranami (up-armored). Unknown reserve front unit, summer 1942.— Also a KV-1E (Ehkranami) i think. The KV-3 and 220 are the same vehicle. 220 coming from the designation Object 220. An Article isn’t in the works at the moment, but will come in the future. KV-3 and T-220 are not the same vehicle. There are two different vehicles. Indeed so. KV-3 actually falls under Object 150, 221, 222, 223. According to Yuri Pasholok. Please show me the quote from Yuri stating that KV-3 and T-220 are the same vehicle. I didn’t say he did. My last comment states my mistake in the numbers. Your link is the old article based on the work by Solyankin, which is not reliable at all. The article was written before Yuri published his research on KV-3 (and other super-heavy KVs); Looks like only the document scans were taken from Yuri Pasholok’s LiveJournal blog. Originally KV-3 went under the code “222”, which would be the modified T-150. Later the designation “KV-3” was given to another vehicle, which went under the code “223.” It was to be built using the components of experimental T-221. There was more to it, obviously; KV-3 has really messed-up history. The bottom line is you would be more accurate if you said that the first(!) KV-3 and T-150 were pretty much [although, not entirely!] the same vehicle. There were some similarities with 220, but it is in no way the same vehicle. 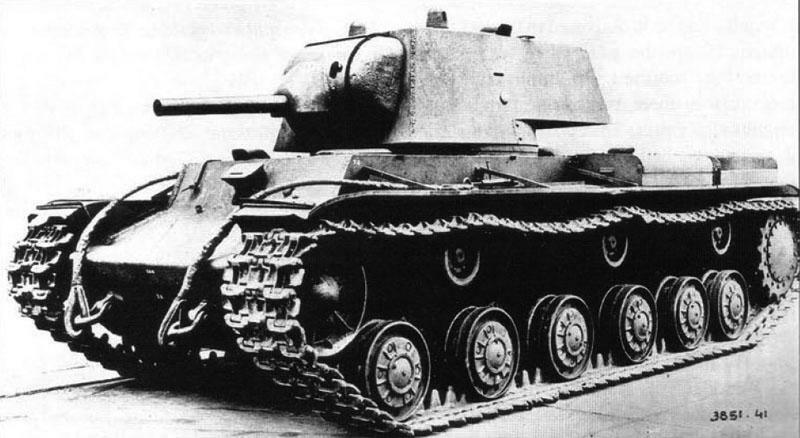 The KV-220 was basically the first step towards the KV-3. Yes the KV-220, and the KV-3 are different tanks, the KV-220 is in a way the KV-3’s prototype/early design. Hello, I noticed the KV1’s suspension was not symetrical on each side, the roadwheels and return rollers have a noticeable offset, for what reason? 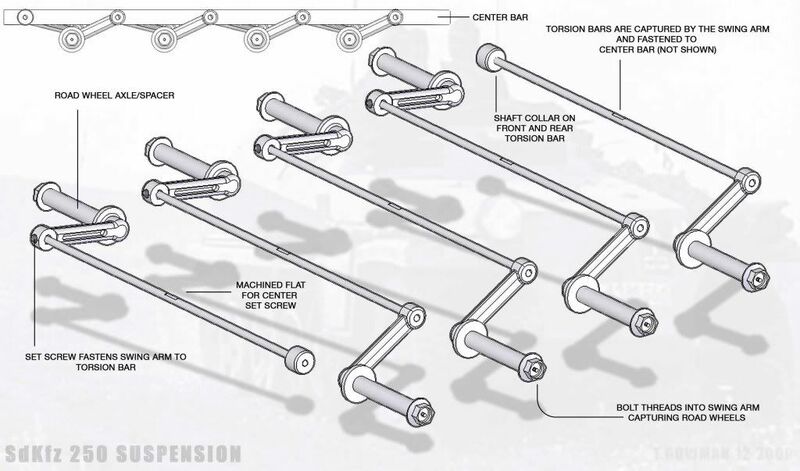 The KV-1 uses torsion bars which take up the entire width of the hull, so one side of the running gear has to be offset in order to have proper working suspension on each side. 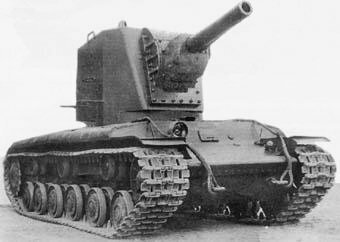 Was the KV-9 prototype armed with the 122mm U-11 gun real? as well as the KV-11 that was proposed with the F-30 85mm? found those bits of info from wikipedia. I believe so, Wikipedia states that one KV-9 prototype was built, and I have seen models of it on google images. Either it was leaked to the model company by some spy, or it’s a real thing. The KV-11 I am not sure about, but as you know, it exists in world of tanks. Hello from the NA blitz server! What does the T-150’s gun mantlet look like? I’ve seen pictures where it looks like the mod.41, or the mod.42. I must admit, I’ve never seen a 7.61″ tall KV-1 before… shouldn’t these dimensions be in feet and not inches? I’m no tank expert, just an enthusiast. I enjoy using your articles as references for technical illustrations, just as a hobby. I think I’ve noticed a discrepancy and wanted to clarify. It’s stated in the article under paragraph “The KV-1 model 1939 and 1940” that the model 1939 was initially supposed to be equipped with the F-32 gun, but due to circumstances the first 50 as well as all remaining 1939 models were equipped with the L-11. However the side depiction of the KV-1 Prototype 1939 in Finland is shown with what doesn’t look like a L-11, same goes for the depiction below it of the “KV-1 model 1939 with welded turret. Central front, summer 1941”. The barrel looks too long and there is no recuperator above it, they look more like a KV-1A than a KV-1 model 1939. My first thought was that the KV-1 Prototype was equipped with the F-32 while the rest from 1939 were equipped with the L-11. Do these images represent accurate historical models or are they just for fun. This article is in serious need of a rewrite. In fact, most of our early articles are. Most of those designations are not historical, and are in fact, arbitrary. A new modern naming system should be developed to give names to all these variants. For technical illustrations, this article is not the best at all. Why do some KV-1 Model 1942s have an angled rear, while some of the others have the stadard rounded rear? Would the KV-1 prototype with a 57mm gun, the same as the T-34-57, fit under the KV-1 section, or would it have to be it’s own category? It should be its own article. However, I haven’t seen any info about such a vehicle. Do you have anything you could share?